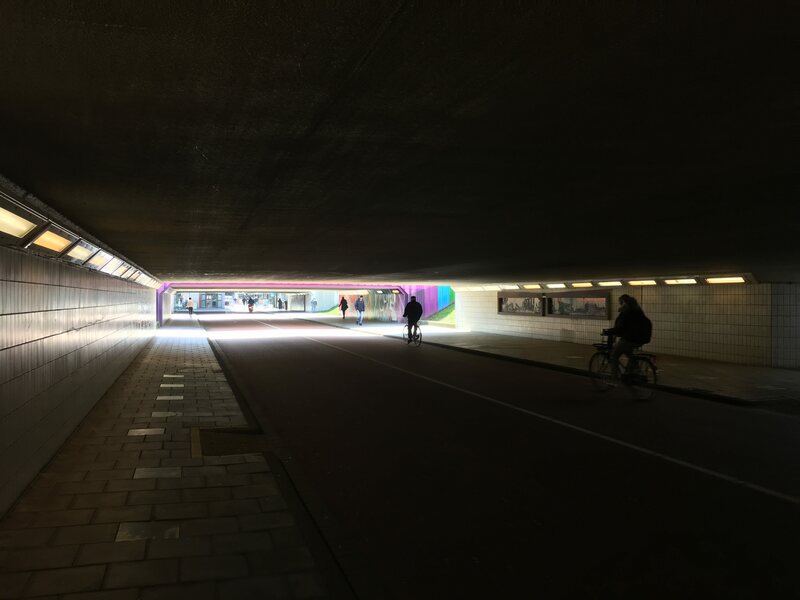 This is the third and final part of Jonathan Mertzig's series on biking and biking infrasctructure in the Netherlands. You can read part 1, about wayfinding and complete streets and networks here, and part 2 about multimodal transit and bike parking here. While I was thoroughly impressed by the state of cycling in the Netherlands on my first visit, I think what has impressed me even more over the years is seeing the constant tweaks and innovations that continue to improve the biking experience. The Dutch have established many great standards in areas like wayfinding and street design, but even these tried-and-true systems are constantly fine-tuned, like with a total refresh of wayfinding typography and various experiments in paving with eco-friendly materials and even glow-in-the-dark surfaces. 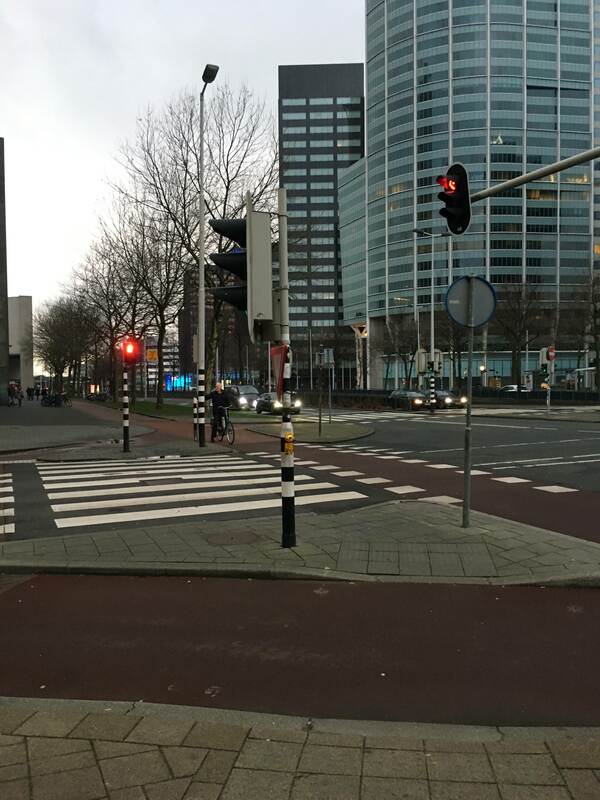 In Tilburg, the city is trying out new “smart” traffic lights that use a cell phone app to track when cyclists are near. The lights can be changed in cyclists’ favor if a large group is approaching. 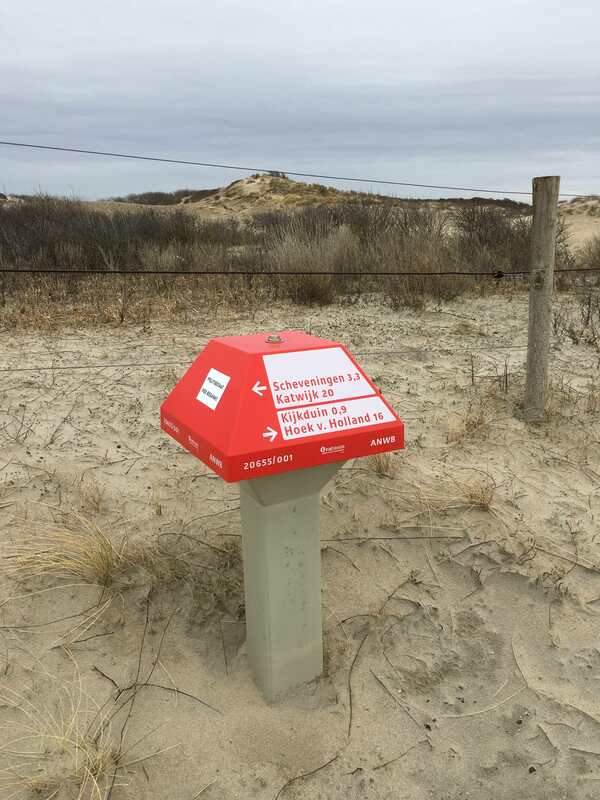 A much broader rollout of a similar system is underway in nearby Den Bosch. On my most recent trip, to the province of Noord-Brabant, I was pleased to find some cool things I hadn’t encountered before, like traffic signals in Tilburg and Den Bosch that track mobile phones to give clusters of cyclists a quicker green light, and a growing network of bike “superhighways” spreading from the center of Eindhoven (even including grade-separated portions avoiding the busiest roads!). I’m always amazed at how careful thought and creative solutions are constantly applied to making biking better. The province of Noord-Brabant is developing a network of “snelfietsweg” routes (basically freeways for bikes!) between major cities, converging on this stretch of spacious grade-separated paths around Eindhoven’s central station. Cyclists can quickly cruise below busy streets on a highway of their own. Takeaways: We can copy some really great, proven ideas from the Dutch to make cycling in Madison better, but don’t be afraid to promote some homegrown innovation! And more importantly, just because we have reason to be proud of relatively great bike infrastructure and culture here in Madison, we should follow the most important lesson the Dutch provide: Never stop improving! Last week the State Supreme Court ruled that Adams Outdoor Advertising does not have a “right to visibility” and sided with the City of Madison in the lawsuit Adams brought against the City for constructing the Cannonball Bike Path Bridge over the Beltline. Adams was trying to sue the city for what they called an unlawful seizure of property, which they claimed was west-facing visibility of their billboard. You can read the Wisconsin State Journal article about the case here. 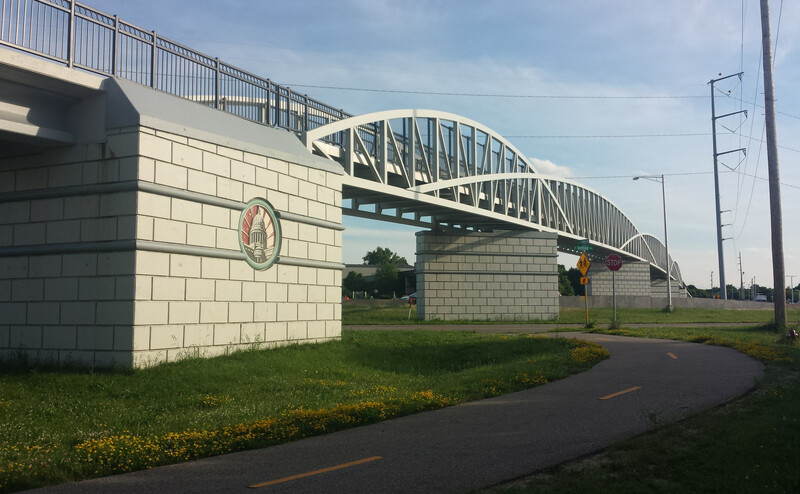 Madison's Cannonball Bike Path bridge, the subject of Adams's lawsuit against Madison. Image credit Jim Wilson. 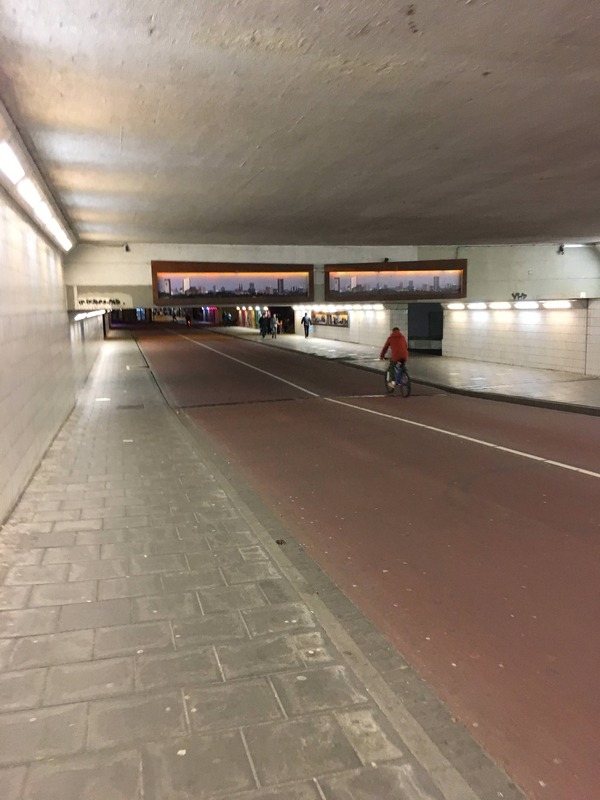 Also, Part 2 of Jonathan Mertzig’s report of bicycle infrastructure in the Netherlands was posted and includes topics including the synergy of biking with mass transit and the quality and quantity of bike parking and support. If you missed it, here’s Part 1. Some news got posted to the Facebook page. On June 12, Fitchburg’s Common Council approved the construction of four foot shoulders on a portion of Whalen Rd., which is a huge win for the cycling community, so congratulations to Bike Fitchburg, the advocates who called and emailed about it, and the alders who made the approval happen. Also posted was an update to the construction of the Sub-Zero Parkway along the Badger State Trail. The city of Fitchburg has closed the Badger State Trail at Marketplace Drive to permanently remove the intersection. 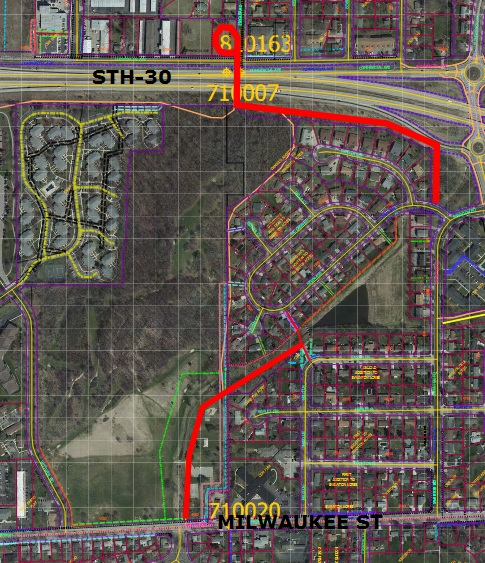 The new detour around the construction is to take McKee Rd east, head south on Seminole Hwy, and then back to the trail on the newly opened Sub-Zero Parkway. On Monday, June 25, Bike Fitchburg has its monthly meeting. The meeting is open to the public and starts at 6:30 PM at the Fitchburg Public Library. As the new Director of Transportation has officially started his job today, Monday, June 25, Tuesday, June 26 will be the final meeting of the Pedestrian Bicycle Motor Vehicle Commission (PBMVC). The short agenda includes an approval of the geometry for the Atwood Avenue reconstruction, and an ask that Engineering add to the transportation improvement program the Capital City Trail crossings at Ohio St. and Brearly St. so they may be raised and improved. Brearly St. was recently reconfigured to stop motor vehicle traffic and allow bicycle traffic through unimpeded. The crossing at Ohio St. is infamous for its bone-rattling bumps while traveling along the path. Read the full agenda here. The committees set to replace the PBMVC and a few others are the Transportation Policy and Planning Board (TPPB) and the Transportation Commission (TC). On Wednesday, June 27, Part 3 of Jonathan Mertzig’s report from the Netherlands will be posted, so be sure to check back then to read it! On Thursday, June 28, there will be a public input meeting regarding the reconstruction of Pleasant View Road between US-14 and Mineral Point Road. The meeting begins at 6:00 PM at the Middleton City Hall Council Chambers. Read the press release about the meeting here. On Saturday, June 30, there are two big biking events that are worth your attention. First is a Family Bike Camping trip to Lake Farm County Park hosted by The Cargo Bike Shop. This family friendly overnighter will leave from The Cargo Bike Shop on Williamson Street at noon. The ride is roughly 7 miles long and will include dinner at the park’s group, s’mores and a campfire, and on Sunday morning, coffee from Cafe Domestique and a selection of pastries. Vegetarian options will be available. Cost to join the ride is $30 to help pay for camping registration fees, food, and logistics. This is the first of two planned family bike camping trips planned by The Cargo Bike Shop this year. 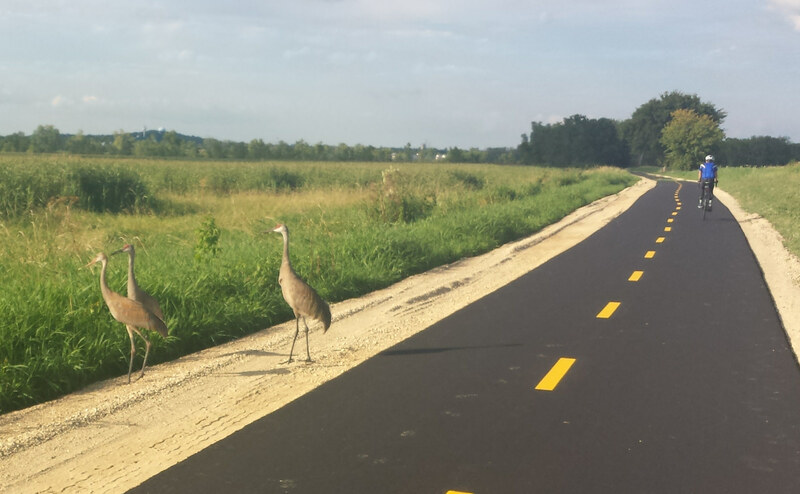 Cranes on the bike path through Lake Farm County Park. Image credit Jim Wilson. Also on Saturday, join the BiciClub Latino de Madison for the first of their longer group rides. While still organizing the Tour de la Familia Latina, the club now also hosts this ride for more experienced riders. 30 miles, no drop, meet at 8am at Cafe Maya on Odana. From the announcement: "Sabemos que hay ciclistas más experimentados que han preguntado por rodadas más largas, así que las hemos creado. Este evento está diseñado para ciclistas que ya conocen sus capacidades y quieren recorrer mayores distancias fuera de la ciudad de Madison. Esta primera rodada será de 30 millas y a diferencia del Tour de la Familia Latina, no tendremos bicicletas de préstamo, ni apoyo mecánico al inicio del evento. Pedimos que los ciclistas que nos acompañen, traigan su kit de reparaciones básicas, botella de agua y lo que sepan será de utilidad durante el recorrido." Saturday also will have a fundraiser for the Blackhawk, Verona, and Madison West Middle and High School mountain bike teams. The fundraiser is called the Crank-A-Thon and will be located at Deaths Door Distillery at 2220 Eagle Drive in Middleton. Read event details here. This is the second part of Jonathan Mertzig's series on biking and biking infrasctructure in the Netherlands. You can read part 1, about wayfinding and complete streets and networks here. The final installment of the series will be published next Wednesday. You can take your bike on most trains for a small supplemental fee outside of peak hours. Here on a new Sprinter train, they even explain the rules in English. 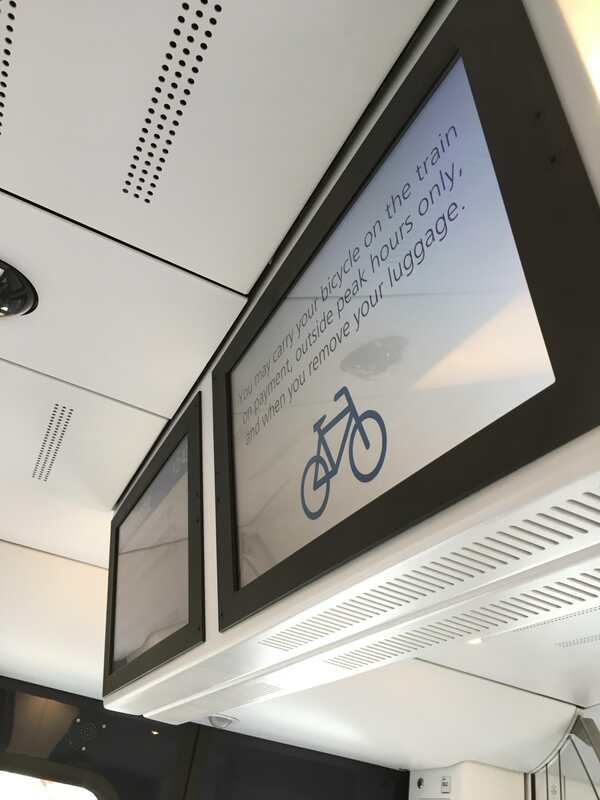 While long-distance, intercity journeys are quite possible with the Dutch cycling network, you might find taking a train or bus to be a bit more efficient, and many public transport options in the Netherlands make it easy to take your bike with you. Nearly all classes of service on the Dutch railways support transport of cycles for a small supplemental fee (with some reasonable rush hour restrictions). 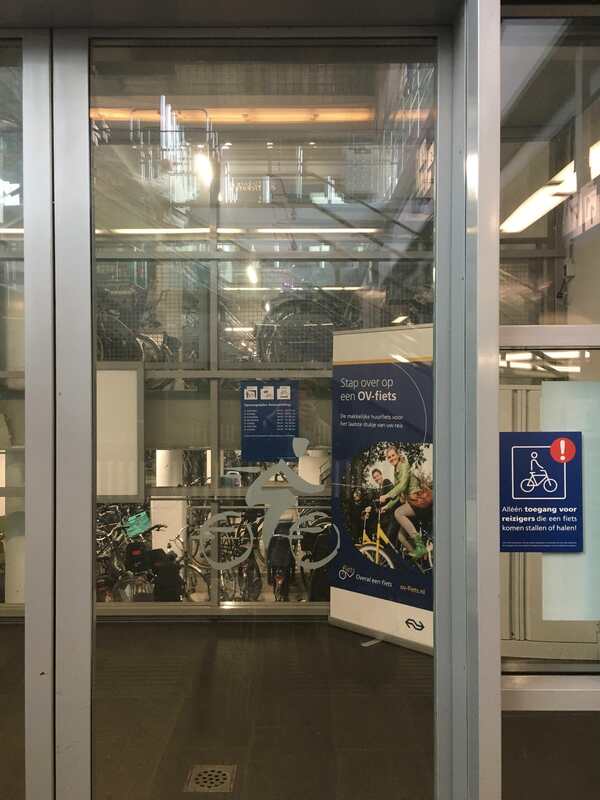 Over the last decade the Dutch railways actually have been phasing out racks in trains because mounting bikes on them was deemed too cumbersome and inconvenient, and instead have shifted toward favoring spacious standing areas for cyclists to encourage quick and easy loading of bikes. Trams and long-distance buses also often have space that can accommodate cyclists. Notably, most cycle accommodation in Dutch public transport also serves as a good example of “universal design”—the same roll-on/roll-off compartments that provide space for cyclists can also accommodate wheelchair users, families with baby carriages, or tourists hauling luggage. (More info on taking bikes—or a few other wheeled things—on the train). Entrance to the bicycle center beneath the rail station in Hilversum. The facility offers secure bike parking, a repair facility, and bike rentals. Apart from the possibility of taking your bike along for the ride, Dutch transport hubs also tend to provide excellent facilities for cyclists, with large amounts of secure bike parking and on-site facilities for repair and rental of cycles. The national public transit card system (OV-Chipkaart) even integrates with a nationwide bike share scheme, the OV-fiets, which lets you hire a bike at most stations. And if you were wondering, yes, it’s possible to even bike to the airport—bike paths can take you all the way to the terminal at Schiphol. A pair of OV-Fiets bikes on the street in Maastricht. 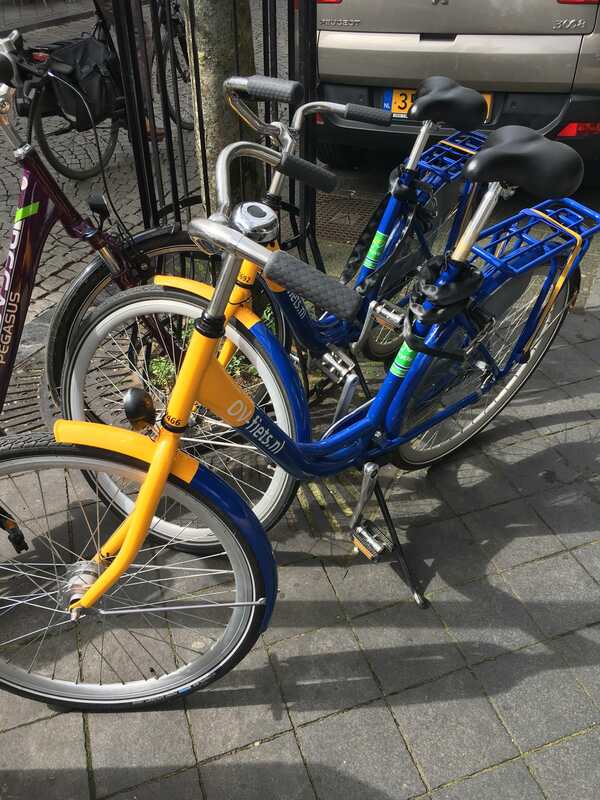 The OV-fiets is a nationwide bike rental scheme connected to the national transit chip card (OV-Chipkaart) that allows you to bike up a bike at most major railway stations. Madison’s most recent chance at having intercity rail service was unfortunately squandered, but while the plans were still on track—no pun intended—multi-modality incorporating cycling was a key part of the designs… some of the initial reasoning for choosing Judge Doyle Square as a location for a bike center was the synergy with a potential future train station. When opportunities for planning intercity connections arise, let’s make sure those rail- (bus-, hyperloop-) to-bike connections remain a key part of the discussion. A bike shop at Maastricht central station, one of two facilities offering bike rentals and repairs at the station. Bike parking is quite plentiful in Dutch cities, but it seems they can still never build quite enough. 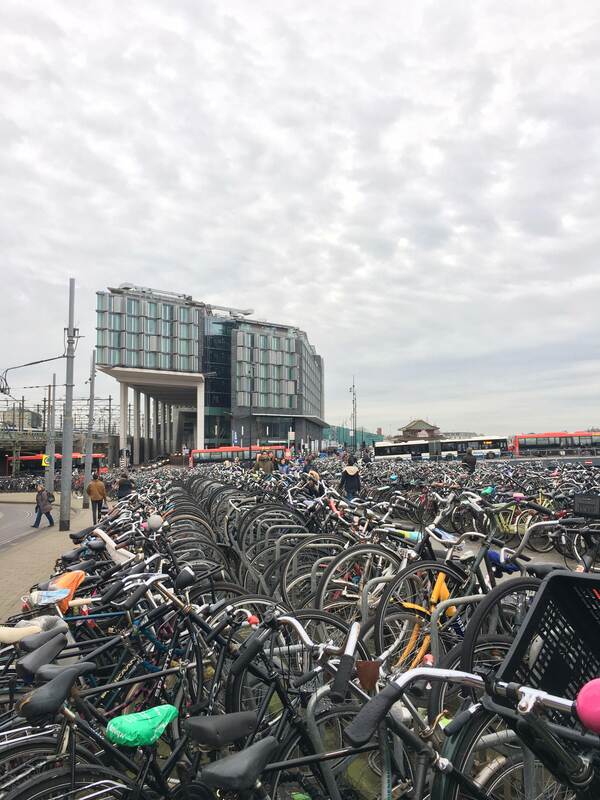 Perhaps the most extreme example of demand for bike parking is around Amsterdam Centraal station, where several huge parking areas, including a few multi-level garages, are often overflowing with bikes. If there’s one glaring problem with cycling in Netherlands, it’s parking… they just can’t build enough! But from an American cyclist’s perspective, the parking situation in most Dutch cities seems downright luxurious. Most major destinations like stores, schools, and offices have large bike parking areas with quality racks and many include lockers available for rental to long-term users. In city centers or at transit hubs, centralized parking garages provide a place to stow your bike before exploring a neighborhood on foot or taking a journey on mass transit. 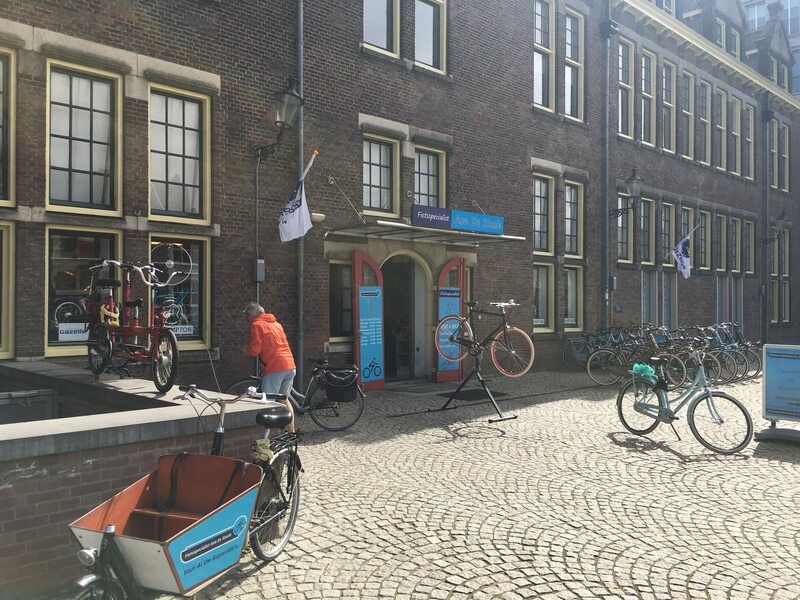 The best types of these facilities, known as a bewaakte fietsenstalling, combine a large number of lockers or locking racks with video surveillance and on-site attendants to provide a highly secure place to stow your bike. And as a bonus in the often-rainy Netherlands, many also shelter your bike from the elements. In the past, parking in such facilities was typically was a paid service, but in recent years I’ve noticed an increasing tendency to provide such facilities for free. The preference towards providing free centralized parking helps maintain a less crowded streetscape with reduced need for on-street parking—and less of an excuse for illegal parking—and helps cut down on bike theft and vandalism. Many of these parking complexes also provide bike maintenance shops, self-service repair areas, and rental facilities. 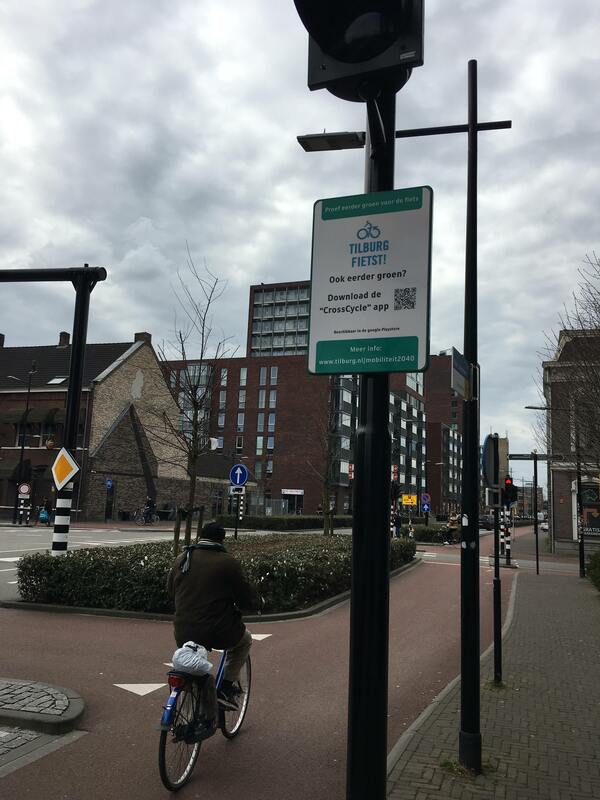 Den Haag provides an example of the move towards free centralized parking in many cities. 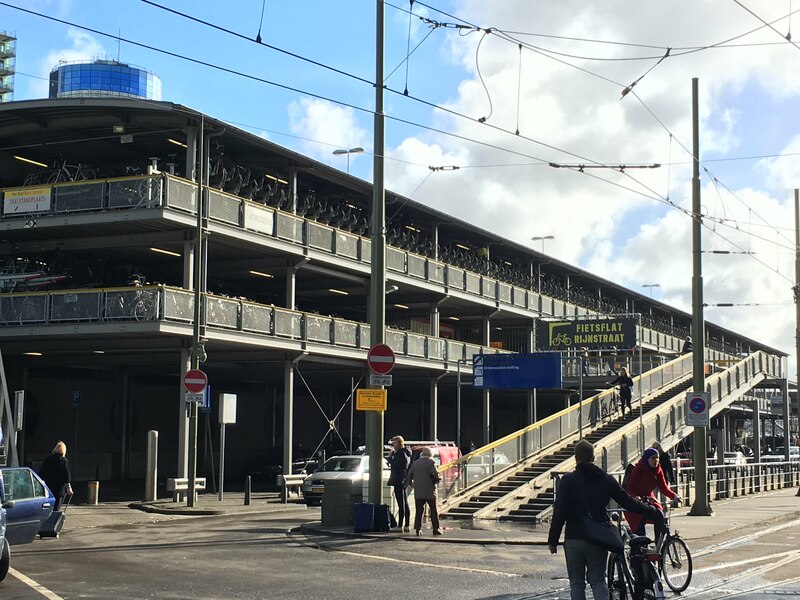 To help eliminate clutter from chaotic bike parking on busy shopping streets, the city expanded their secure parking garages and made them available for free. Apart from the ample provision of parking and repair facilities, supplies for simple repairs and bike accessories are widely available at locations beyond specialized cycling retailers. 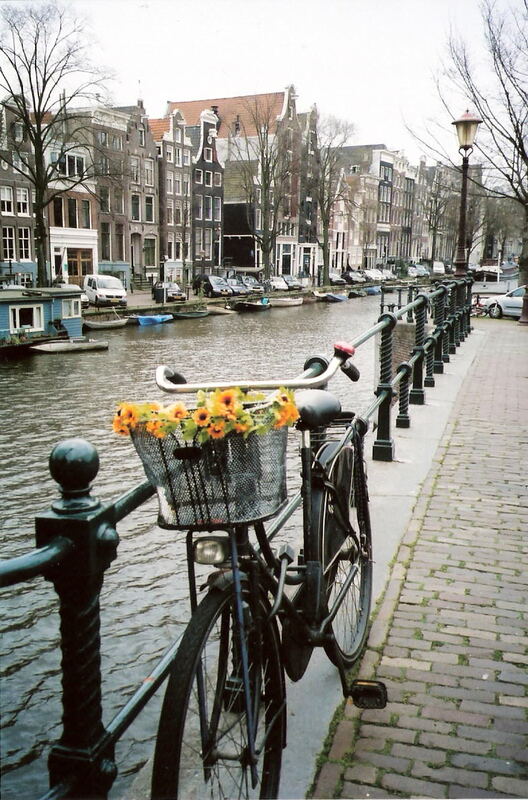 Most variety stores and convenience shops carry at least a basic selection of supplies like tubes, patch kits, and accessories like bells, locks, lights, and reflective gear (notably, a trip to the Netherlands is a fantastic opportunity to stock up on affordable cycling kit!). So if you find yourself with a flat tire, a quick fix is usually a short walk away. 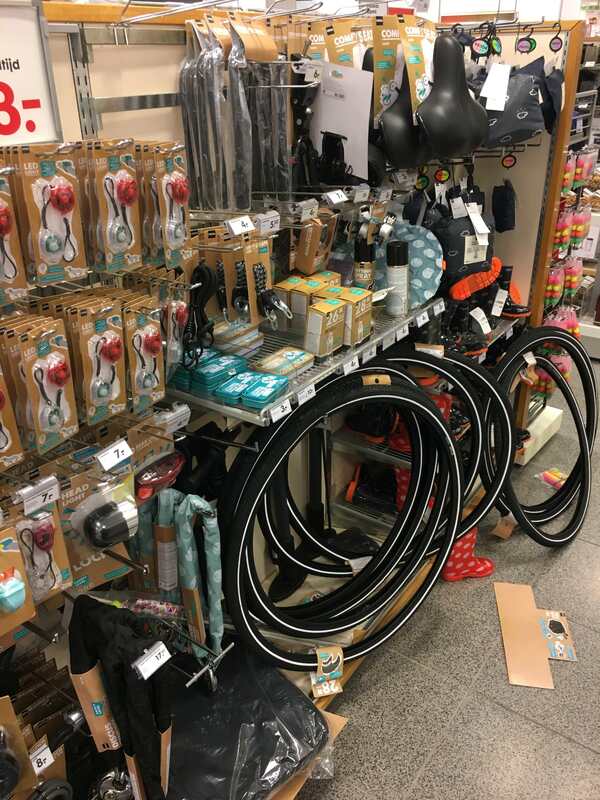 Basic bike supplies are easy to find—here at a HEMA store (sort of like the Dutch equivalent of Target), you can find a variety of parts and accessories. Outdoor markets are not only a place to buy fresh veggies and other edible delights… you can often find bike supply vendors and repair stands at many markets. 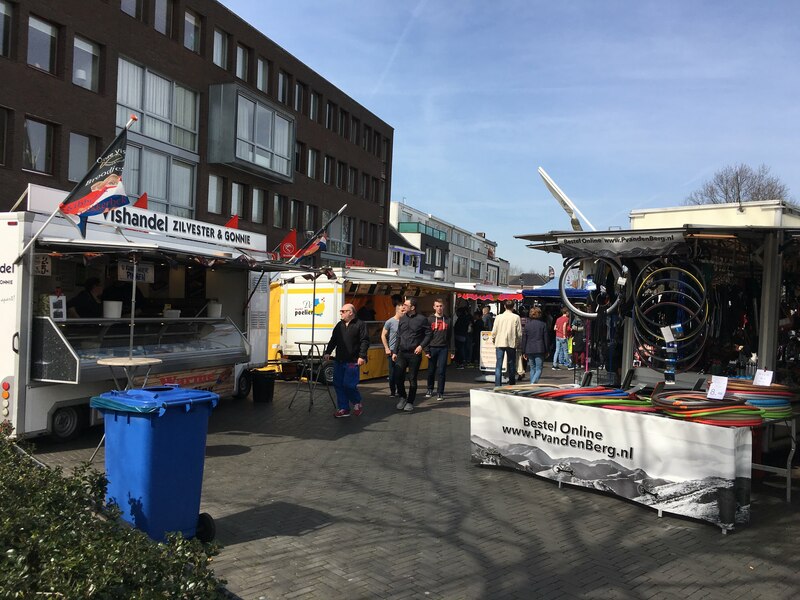 Here at the Woensel Weekmarkt in Eindhoven, you can find two Dutch staples right next to each other: fresh herring and bike tires! Takeaways: The Judge Doyle Square bike center could be a great pilot of this sort of concept, but there are many other destinations around town where quality indoor parking could be a huge perk to encourage cycling. Many major employers and institutions like the UW have good connectivity to our bike routes but perhaps not the best opportunities for parking. We should encourage high-quality indoor bike parking to be a part of development plans. And maybe with that parking, include a nice bike repair stand! And while we’re at it, let’s nudge our neighborhood retailers to carry at least a modest selection of basic bike repair supplies. We had some memorable rain events last week, leading to flooding, downed trees, and other complications for pretty much everyone. Saturday morning I woke up to a large tree branch in the middle of the street. 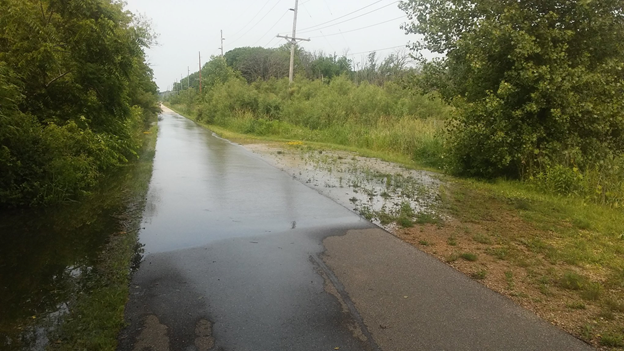 As we all experienced, and as the pictures submitted to MB’s Facebook page, bike paths suffered downed trees and flooding as a result of these storms. I know that in the moment we just deal with the obstacles before us and can forget to let the city know so the mess can be cleaned up. As a reminder, the City’s “report a problem” site provides a way to let the city know about these issues and hopefully address them quickly! 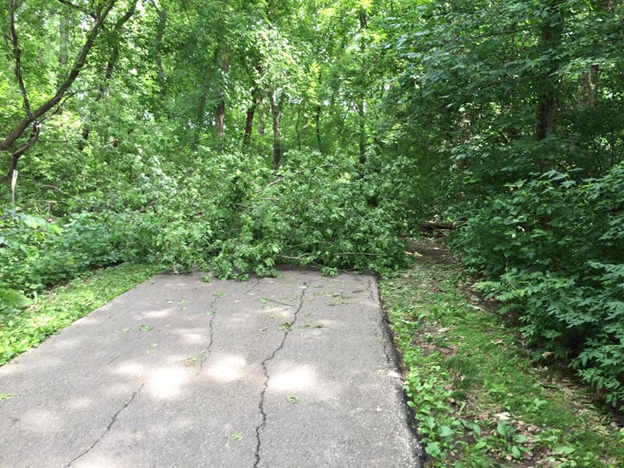 “Path down from Odana golf course, about 100 ft from SW Commuter Path.” Photo by Don Thornton. “Green Prairie/Dunn’s Marsh storm flooding.” Photo by Scott Sauer. As if all this rain wasn’t challenging enough, the record high temperatures have not been for the faint of heart. Undeterred, the Tour de la Familia Latino rode this past Saturday. I have not heard how many folks attended. We’re hoping someone from the BiciClub Latino de Madison can let us know! The Madison Bikes Board meets at 6:00pm–8:00pm on Monday, June 18 at the Madison Public Library, 201 W Mifflin St, Madison, WI 53703. Please attend and learn what we are doing and how you can help! On Tuesday, June 19 the Madison Common Council meets at 6:30 at the City-County Building, 210 Martin Luther King Jr Blvd, Room 201, Madison, WI.. The agenda looks packed but about half-way through they will discuss the much maligned “hairball” intersection of John Nolen/Williamson/Blair/Wilson streets. The full agenda for the meeting is here. Chris Rickert from the Wisconsin State Journal discusses the differing opinions on if the proposed redesign is satisfactory in this article. While it looks like the Council is likely to move forward with accepting the report on the redesign, it is definitely not too late to ask for changes that would further improve the bike/walk environment at this stressful intersection. Also on Tuesday, Madison Bikes Advocacy Committee will meet from 6:00 pm – 7:30pm at Bendyworks, 106 E Doty St #200, Madison, WI. Don’t forget to check Madison Bikes blog on Wednesday, June 20th for the second installment in a three-part series by Jonathan Mertzig. Jonathan lived in the Netherlands and shares his experience biking and walking in that country, where planning, engineering and policy has made biking the preferred mode of transportation in urban areas. On Thursday, a new BCycle station will open at and in partnership with the Goodman Community Center. Center participants can get a free membership, and there will various family-friendly festivities, 4:30-6pm. Editorial note: This is a three-part guest post by Madison Bikes supporter Jonathan Mertzig. Thanks, Jonathan, for sharing your experience living and cycling in the Netherlands, and what we can learn from the Dutch in improving cycling here in Madison! Part 2 will be published next Wednesday. In the summer of 2005 I had the privilege of attending a Nederlandse Taalunie (Dutch Language Union) summer course held in the beautiful town of Zeist, a short bike journey away from the Netherlands’ fourth largest city, Utrecht. Apart from being an amazing immersive experience in learning the Dutch language, the course also provided plenty of opportunities to experience the Netherlands’ amazing bike culture and infrastructure. After class each day, our group of students from around the world could grab our bikes and head off for an adventure, exploring our surroundings without ever even needing to look at a map. You could pick a destination and follow the signs for a safe route to just about anywhere. Even the most novice cyclists, many coming from countries with almost no culture of cycling, could in a few days become quite confident riders. In the years since, I’ve had many opportunities to return to the Netherlands and observe the evolution of bike facilities there. The Netherlands can seem like a cyclist’s paradise that would be hard to match elsewhere, and indeed, there are some local factors in the popularity of cycling we can’t easily match: compact cities, short distances between towns, relatively flat terrain, and milder winter weather. But there are plenty of things the Dutch do well that can serve as examples to replicate elsewhere, including American cities like Madison. A particularly information-dense cycling route wayfinding signpost outside Amsterdam’s city hall. 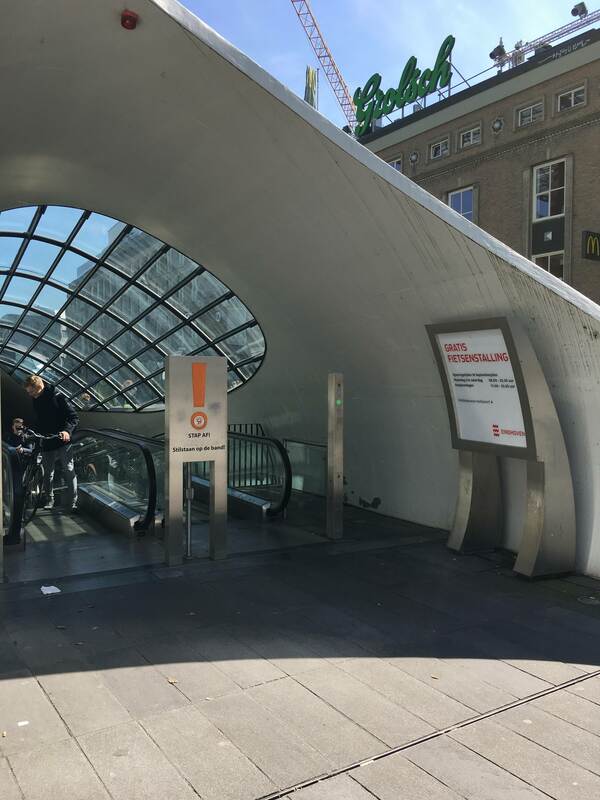 Red signs point to locations of interest (like the Artis zoo, or the central station), major neighborhoods, or even other cities (like in this example, Hilversum and Utrecht). The green signs denote major recreational routes… from here you can even follow the signs to take the Stedenroute (“City Route”) all 340km to Brussels—no guarantee though that the signage will be as good once you cross the Belgian border! One of the first things that stands out to visitors observing the bike scene in the Netherlands—besides the sheer number of bikes everywhere—is the excellent system of wayfinding signage throughout the country. The national travel association, ANWB, provides uniform standards for bike and pedestrian wayfinding signage, with signs installed at nearly every intersection or path access point throughout the country. Signage features directions and distances between cities, highlights major points of interest, and delineates regional and national recreational and long-distance routes. In some scenic areas, a lower-profile format of bike wayfinding signage is used, though the design features are otherwise consistent with the rest of the national signage system. Here you can choose your direction through the dunes at Kijkduin. The signage scheme for cyclists is visually distinct from other types of road signage, color-coded (red for general directions and local points of interest, green for recreational routes) and uses consistent shapes, symbols, and highly-readable typography to provide a universally recognizable scheme for navigation. The scale and placement of signage also often doubles as a useful reference for those traveling on foot. One can easily navigate within cities or take a long-distance ride without much need to break out your smartphone… just follow the signs. The green-signed recreational route network ties connects historical town centers and scenic natural areas around the country. 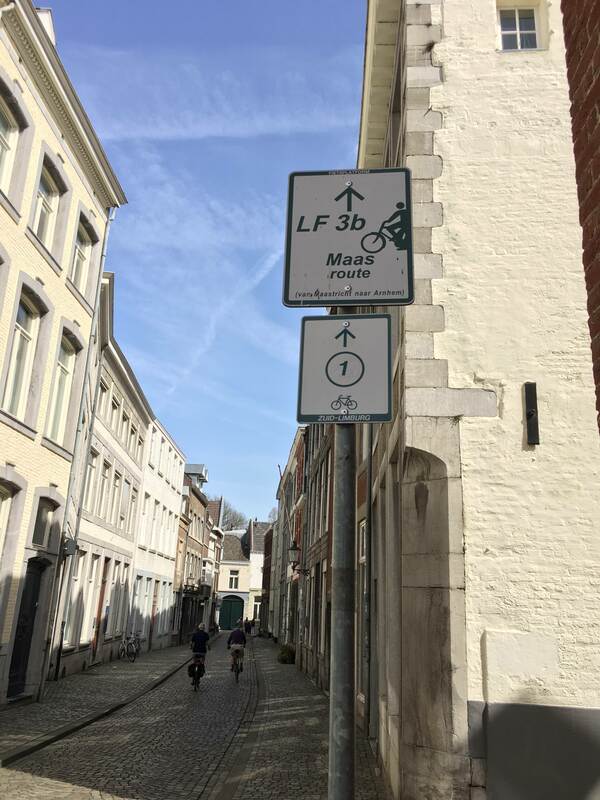 Here in Maastricht, the “Maas route” LF3b takes you through cobblestone streets and up the St-Pietersberg, one of the few hills in Dutch territory that actually is referred to as a “mountain.” Contrary to popular belief, the entire country isn’t flat! Takeaways: Being able to find your way around without much of a hassle is key to a great cycling experience, especially for beginners and visitors. 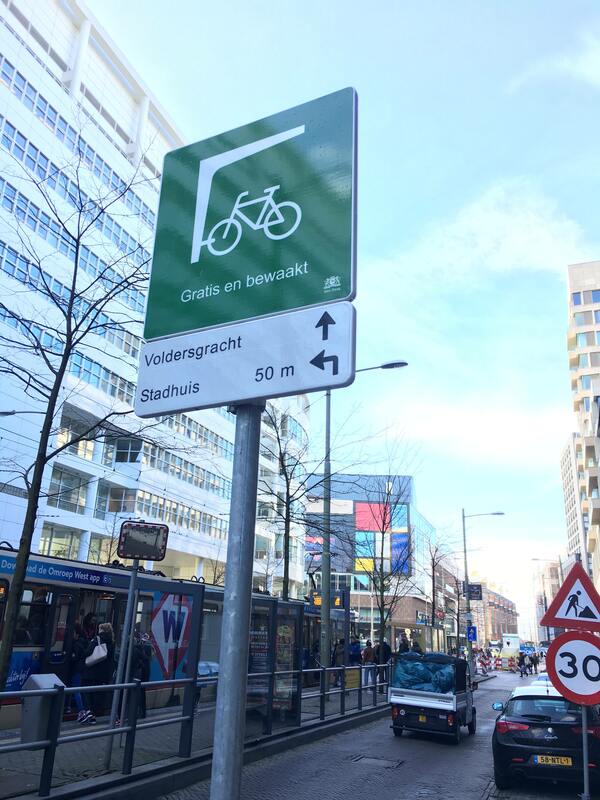 We should strive for a system of consistent, high-density signage for cycle-friendly routes. 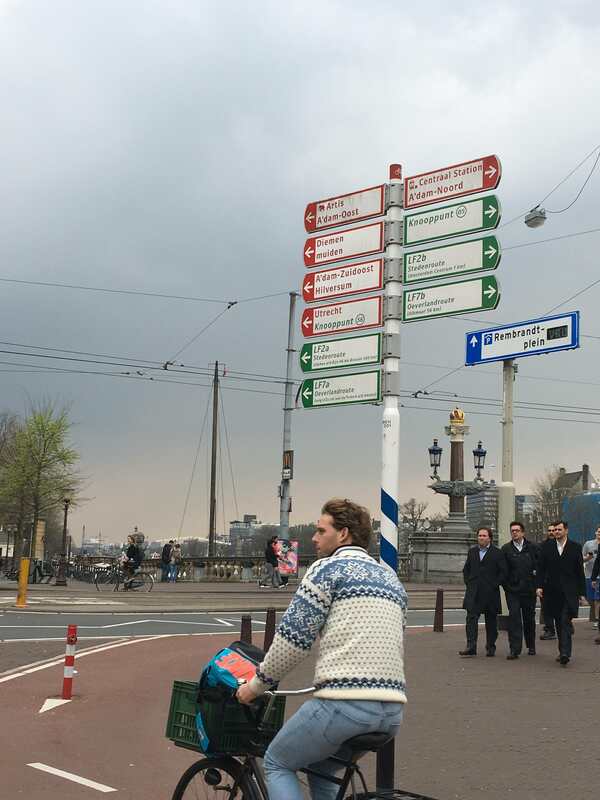 The Dutch standards for signage provide a great example of a well-executed wayfinding system. 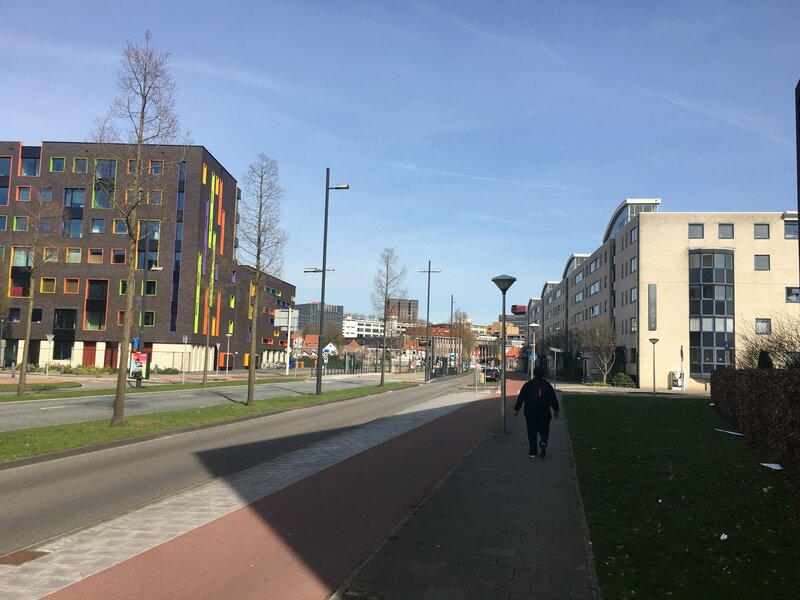 Cederlaan in Eindhoven is a great example of a Dutch “complete street.” This street, built in a new residential development in a previously industrial district, combines a bus rapid transit way and stations, general traffic lanes, a separated bike path, parking lanes, and sidewalks. The network of bike routes in the Netherlands is quite comprehensive, with a thoroughly interconnected system of urban bike lanes, separated bike paths, traffic-calmed neighborhood streets, and rural roads and trails suitable for safe cycling. Bike routes are easily recognized through consistent visual cues, like the aforementioned wayfinding signage, or the use of red pavement to mark lanes and paths reserved for cyclists. Cycling becomes a practical option for commuting, shopping, or even intercity journeys because it is easy to travel by bike without having to contend with riding on unsafe roads or breaks in the network. It is quite possible to find a safe bike route between most any destination in the Netherlands, whether at neighborhood level or cross-country. Outside the cities, an extensive network of paths crisscrosses rural and natural areas, making it possible to easily bike between towns while enjoying the scenery. 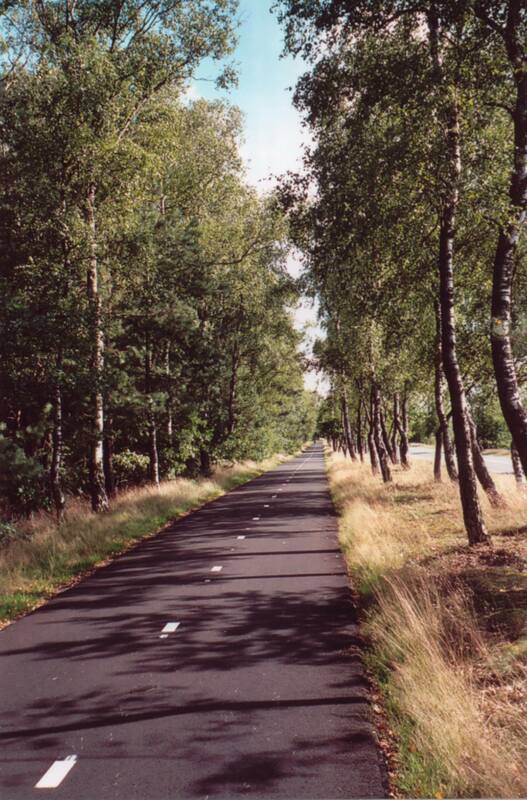 Here is a path that connects Zeist and Amersfoort via the wooded hills of the Utrechtse Heuvelrug and heathlands of the Leusderheide. Taking a look at Dutch street design also shows what “complete streets” looks like when proper design and investment is put into the concept. It’s not unusual to find arterial streets that combine safe, separated lanes for bikes, cars, and mass transit, and still have ample space for sidewalks, landscaped medians and terraces, and on-street parking. Smaller neighborhood streets use designs that are appropriate for the context and available space, like traffic calming measures combined with on-street bike lanes, or even intentionally ambiguous zones (you may be familiar with the Dutch term woonerf) where a blending of low-speed traffic actually improves safety and livability for surrounding neighborhoods. Not all Dutch street designs are perfect and not all are feasible for Madison’s streets, but the overall experience is noticeably better than American design standards. The intersection along Rotterdam’s Blaak avenue provides a particularly complex example of a Dutch “complete” street. Bike lanes and broad sidewalks on each side flank a busy avenue, the start of a separated busway, and a tramway. Aerial view. Takeaways: Find the holes in the network and prioritize these for improvements. The Madison area has done a good job of this in terms of regional and cross-town routes, but the real gaps are at a more local level. Think about those neighborhoods where you can’t easily use a bike to do errands like getting groceries, take your kids to school, or visit the park, and target those areas for improvement. Make sure proposals for new infrastructure connect up to existing routes in safe and logical ways. American discussions of measures like traffic calming are often framed as “experiments” or denounced by opponents as “unproven” but Dutch cities are full of working examples of complete streets and safer design paradigms, and these are often implemented in situations where space is quite limited compared to American streets. And investment in quality bike-friendly infrastructure doesn’t necessarily have to come at a cost detrimental to those who drive—any trip on the superb freeways of the Netherlands quickly demonstrates that the Dutch don’t hate their cars! The Dutch don’t view transportation planning as a zero-sum game where only one mode “wins.” (For more on the state of the overall transportation system in the Netherlands, and how bikes fit into the picture, I recommend this report from Statistics Netherlands: Transport and Mobility 2015). Check back next week for part 2 of the series! We had wonderful weather for Bike Week and all the activities: not too hot, not too cold, and almost no rain! Thanks to all who came by, chatted at the commuter stations, threw a little into the donation box, and signed up to be on the mailing list. We had a great time and met some new people, many of whom didn’t know about Madison Bikes. This brings me to a reminder to all current Facebook friends and email subscribers: If you know someone who would like to know what’s happening with bicycling in Madison, please send them over to us. They can follow us on Facebook, participate in our group discussions, and/or sign up to get our blogs and weekly updates emailed to them directly. We are a stronger, more effective organization when more people join and participate. One of our goals is to keep bicyclists up to date with what’s happening on city committees, in your neighborhood, and when plans or votes are coming up that will affect bicycling. Your voice is very important, and you can help us by getting your friends to join as well. On to the weekly update for this week. After all the activities last week, the coming week is pretty slow for meetings and activities. Madison Bikes Events Committee will meet at 6:00 pm at Barriques, 127 W Washington. 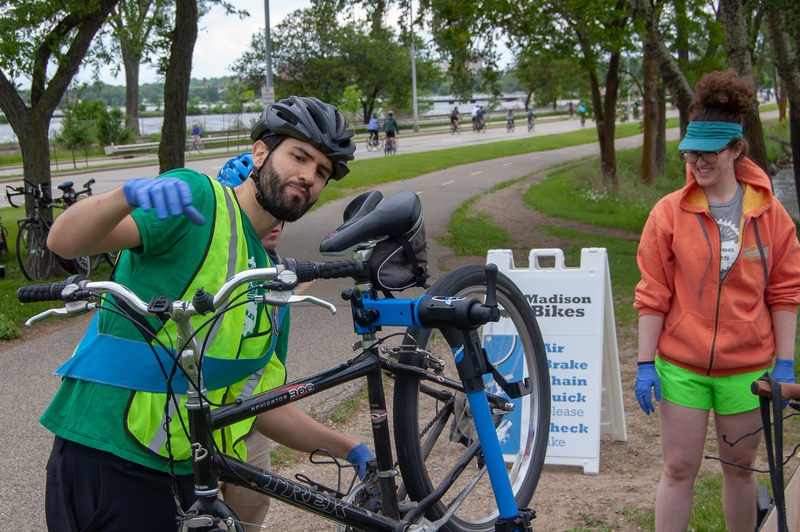 All the Madison Bikes committees are looking for additional volunteers and committee members, so if you are interested in helping plan events, we could really use your help. The Winter Fashion Show, Annual Party/Member Meeting, and Bike Week commuter stations are just some of the events that this committee has planned. Don’t know whether it’s for you? Stop by to say hello and ask a few questions. They’ll be glad to see you! There will be a special meeting of the Plan Commission, at 5:00 pm in Room 103A of the City/County Building, to approve updates to the Comprehensive Plan. This will guide how the city grows, and where, for the next ten years. It’s been through a lot of work and discussed by almost every committee of the city – including several transportation committees -- and now needs to be passed by the Plan Commission and Council. If you would like to see everyone who’d looked at it and what input they had, you can follow this link and click on the documents. The City of Middleton received three responses to its Request for Proposals for consultant engineering services to design a 10 ft. wide path along the north side of Century Avenue, between Old Creek Road and the eastern city limits (near Mendota County Park). There are two rides scheduled for Saturday. The Clean Lakes Alliance will have its annual Loop the Lake ride and fundraiser, starting at Olbrich Park at 10:00 am. The ride is the familiar ride around Lake Monona (about 13 miles), but you’ll be doing it with a few hundred other people. Although most people will finish in about 75-90 minutes, the course will stay open until 2:00 pm. More information at the link about or at the Facebook event. 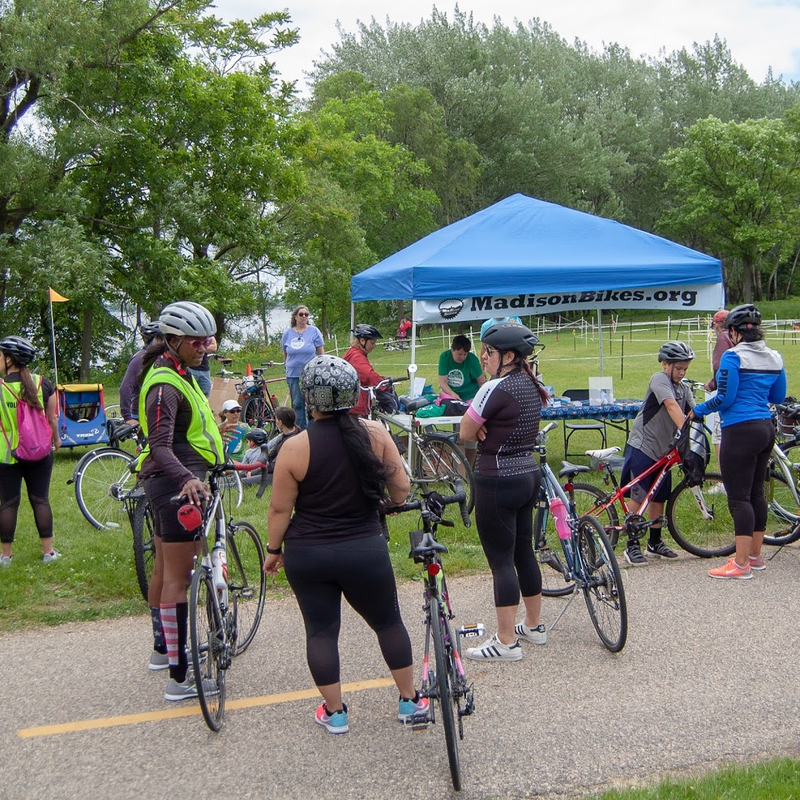 Tour de Familia Latina/Latino Family Tour will start at 1:00 pm at Quan Park, hosted by BiciClub Latino de Madison. They are meeting at bit outside downtown Madison to avoid all the other events going on downtown. Quan Park is right next to the Wingra Creek Path and behind the Alliant Center. 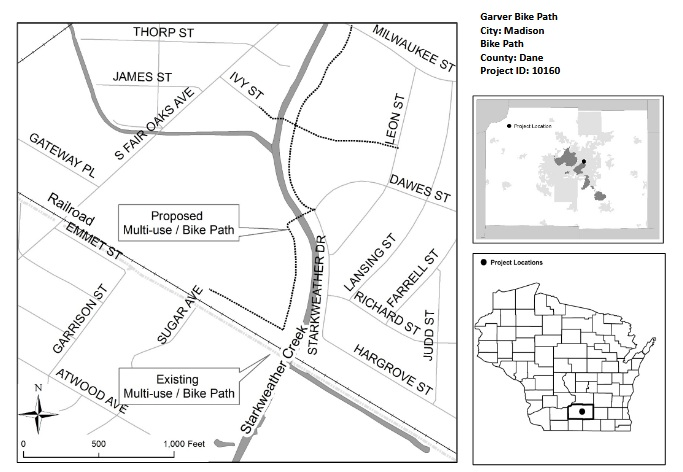 From there, they will be biking to the Lower Yahara River Path, a beautiful ride. All are welcome, and the ride is geared toward families and riders of all ages and abilities. All these events are also listed on the Madison Bike Community Calendar. If you would like to have an event listed, send it over to us. It's June, and it's peak biking season in Madison. Wisconsin Bike Week started on Saturday and will serve a packed calendar of events this week. We from Madison Bikes had a blast at Ride the Drive yesterday, offering free ABC Quick Checks and chatting with lots of you! If you signed up for our newsletter at Ride the Drive: Thanks for stopping by, and welcome to Madison Bikes! More pictures on our Facebook page. In the evening, come to Genna's for a Women's Cycling Happy Hour (open to all women-identified people), starting at 5 pm. 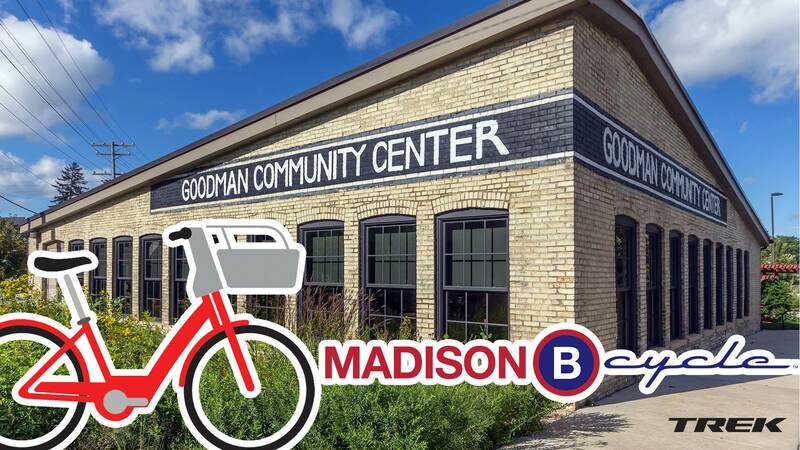 Madison Bikes is joining HotelRED to host a commuter station today! We promise: You won't have to bundle up like we did in this picture from our commuter station during Winter Bike Week! Our friends from Bombay Bicycle Club are hosting a ride and social in the evening, starting at the Hop Garden in Paoli. And north of Madison, join the 1st Annual Pedal For Paws, Creekside Family Bicycle Night in Sun Prairie. 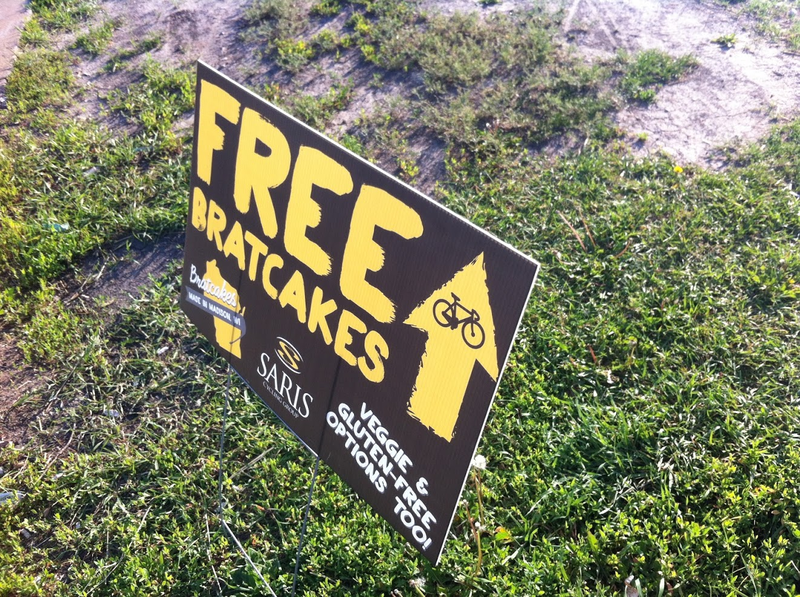 Sun Prairie Bicycling Advocacy Group is hosting their Brats, Brews, and Bikes Ride in the evening. Meet at 6 pm at Wetmore Community Park. Not part of Bike Week: The Madison Area Transportation Planning Board has their regular meeting at 6:30, Water Utility (E Olin Ave). Mifflin Bike Boulevard at Paterson: Celebrate the new diverter! In the evening you can pick among several social events: Revolution Cycles will have a Hot Pizza and Cool Drinks happy hour on the Cap City Trail behind their shop. On the way there, stop for a root beer kegger on the Cap City between First and Division. If you live in Waunakee, join Bombay for a 25-mile ride, departing 5:30 pm at Prairie Elementary. And in Middleton, you can join community leaders for an 8-to-10-mile ride featuring recent investments in bicycle routes and amenities, and learn about future plans and opportunities. Bike Week doesn't end on Friday, but it is the day for the big bike week celebration at HotelRED from 5-6:30 pm. Women-identified folks who want to learn about setting up the suspension on mountain bikes can head to Fitchburg Cycles for a "suspension clinic." Bike Week ends with several options for riding your bike: The Trek 100 charity ride takes off from Waterloo. Bombay hosts a women's ride starting at the Glacial Drumlin trailhead in Cottage Grove. And women-identified folks who want to test some MTBs should head to Blackhawk trail system in Middleton. If you prefer a Madison event, head to the UW Campus for an "open house of interactive programs on the UW-Madison’s East Campus Mall and along the Lakeshore Path." For more details about any of the bike week events, go straight to the Bike Fed's calendar. After the Council approved option # 2 for Winnebago St, on Tuesday, May1 -- a big win for safety because the option provided more buffer between the bike lanes and motor vehicle traffic – the Mayor then decided to veto the Council’s action. You can read his veto letter here. We anticipate that the Council will try to overturn the veto this coming week. See Tuesday’s upcoming events for more information. On Saturday, Robbie and Harald presented work at the Wisconsin Bike Summit in Madison. Other board members, volunteers, and friends of Madison Bikes also attended. On Monday, the Madison Bikes Board will meet at 6 pm at the Central Library. Everyone is welcome to attend. This Tuesday, we anticipate the Madison Common Council will try to overturn the Mayor’s veto of the vote to build option # 2 on Winnebago. The original vote was 11-6, with one alder absent, one abstaining, and one who was chairing the meeting. 14 votes are needed to overturn the veto, and one person who voted in the minority has already said he will vote to overturn. Everyone can hep by contacting your alder to ask that they uphold the action passed by the majority. There was a robust public outreach process and many committee meetings that came before the Council vote, so it is disappointing that the Mayor wants to undo all that work. The meeting starts at 6:30 pm in Room 201 of the City-County Building. You can register to speak, watch in person, or watch the meeting on Madison City Channel. It’s a great lesson in local democracy, and you might become a better advocate or more informed citizen. 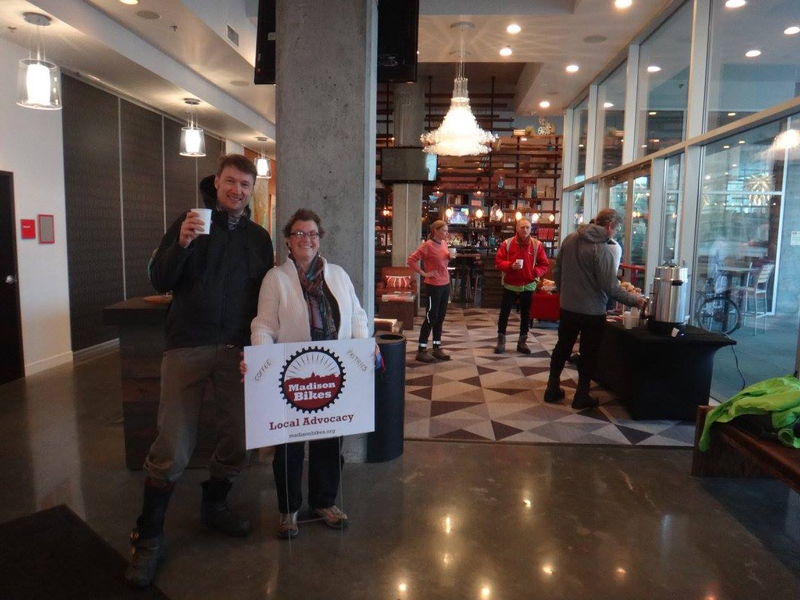 On Wednesday, the Madison Bikes Advocacy Committee will meet at 6:00 pm at Bendy Works, 106 E Doty St, 2nd floor. If you’d like to help us out with our work on advocacy issues, feel free to stop by. Friday, Sun Prairie’s advocacy group will be holding a bike commuter station at Canery Row from 6:00-8:30 am. So if you happen to be out that way, stop by to say hello. We can expect to see quite a few weekend events, as the warm weather is finally here. Saturday, there are two events. First, from 9:00-noon, Christ Presbyterian Church, 944 East Gorham St is holding a bike rodeo. There is a long list of activities for all ages and abilities. Get a tune up, try out an electric bike, get some safety training for kids, enter the raffle, and learn how to fix a flat. Then from 1:00-4:00 join others visiting galleries and art exhibitions by bike for Bike the Arts. The fun starts at the Bubbler at the Central Library and then moves on to other locations. A full list of locations and times can be found here. Sunday, there is a ride for women to check out mountain biking, or just join others. All levels of expertise welcome, whether this is your first time or know the trails very well. Head over to the Bell Joy Ride on the John Muir Trails the Southern Kettle Morraine, N9097 County Road H, Elkhorn. You can always get the info on these events by checking out the Madison Bikes Community Calendar. Have an event that you’d like to put on our calendar? Send it out way. Baltazar is asking people to vote on the name for the community latino bike group that is formalizing their organization. There was a spirited discussion about the Mayor’s veto of the Council vote on Winnebago. Grant posted the results of a survey on what people want in Monona to improve walking and biking. Does banning hand-held cell phone use actually improve safety?